http://catalog.belkin.com/IWCatProductPage...oduct_Id=404607 for the phone - these things are great. Mine is so much clearer than the computer version of Skype and it's only dropped one call in all the eight months I've owned it. Once it comes back into inventory, I'm getting another one! 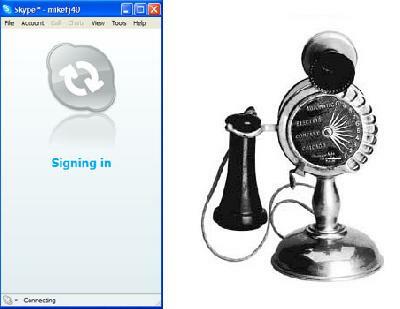 (As of March 2009: We've made this a key element in the new configuration - this phone now dials in and starts the BlogTalkRadio show and then is muted and sits in the background as the emergency broadcast setup while the broadcast computer dials in and takes over the audio presentation for the show). The mixer board is a Radio-Shack model (now discontinued) that retailed for about $90. I picked it up for $39 and it's a really nice model. It'll tie in my audio decks and computer inputs to provide sound to route to the Skype phone so it's turned into quite a setup! Will document and blueprint the entire thing once I get it tuned and the show matured. http://www.youtube.com/watch?v=lRw8GwwMtiY for a model one step up from my 3-channel version. http://support.radioshack.com/doc/320/qse32-2057.pdf for the PDF guide. Our first test broadcasts with the mixer begin this coming Friday evening when GRI will begin test broadcasts with the mixer over a conventional land-line, soon to be followed by a dedicated CAT-5 line to be buried underground after we spend days digging a ditch - What I do for paranormal bliss! We'll keep adding to the article and to add photos as the installation progresses. (March 2009: The CAT-5 line is in and hooked up! We now have the Skype phone hooked in to a Linksys workgroup switch that also ties in the two broadcast computers so we can hook in and do all our special effects and audio controls). Hope this helps someone out there who is considering building a studio for a paranormal radio show like ours! More to come as our installation matures and it grows! As of this time (March), we've adapted the design to the realities of our situation. I expect that the final piece of the puzzle, a Beringer U-Control patch system will port the audio to and from the computer via USB connection to the audio mixer and eliminating a lot of audio issues along the way. To speed the development cycles, I'm increasing the number of shows (test) to daily as we keep tweaking the system and improving on our overall presentation. By the end of the week of March 15'th, we should have this pretty matured and ready to rock. I can't wait for the final pieces to fall into place!